Congratulations are in order for Andy Serkis, he's been made Peter Jackson's second unit director on the eagerly anticipated The Hobbit prequels. Serkis who pioneered motion capture technology with his memorable performance as Gollum in The Lord of the Rings trilogy will oversee select location work on Jackson's two upcoming films where he will once again play Gollum. He said "There was this email out of the blue. It was a fantastic surprise." It is believed that Jackson chose Serkis because he undersands the material and the director's vision and the new role is sure to give the actor's directing career a big boost - he hopes to take charge of his first feature film after wrapping work on The Hobbit films. Serkis will take on the role of Captain Haddock in Steven Spielberg's The Adventures of Tintin: The Secret of the Unicorn which is due in cinemas on October 26. 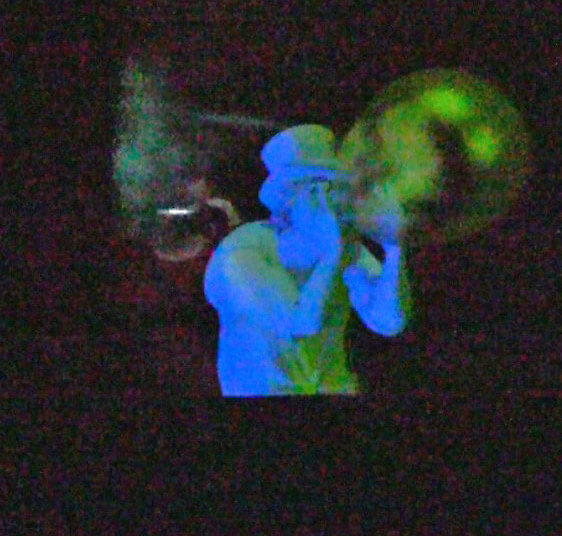 This morning Walt Disney Imagineering unveiled its most impressive and interactive effect to date, adding playful new versions of the famous Hitchhiking Ghosts in The Haunted Mansion who take delight in pranking unsuspecting guests. 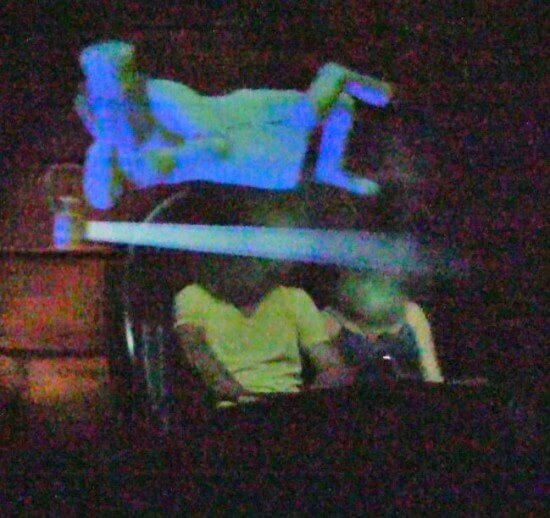 The classic dark ride has always featured ghosts “who follow you home,” appearing sitting next to guests by way of mirrors in the attraction’s final scenes. 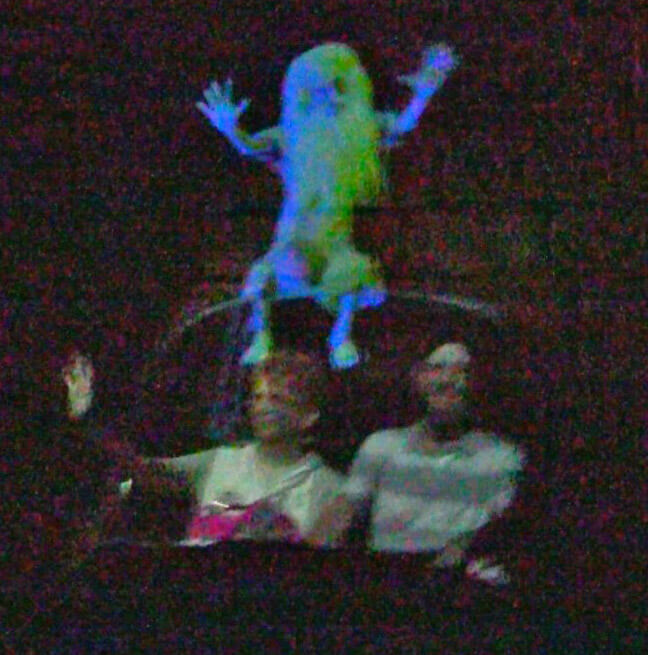 The with new technological advances, Disney’s Imagineers have created more lifelike and fun ghosts than ever before seen in the ride. Ezra, Phineas, and Gus are certainly prankish spooks as they climb in, on, and around Doom Buggies, toying with guests who I witnessed today laughing their heads off in the new scene -- quite literally. In my four rides through The Haunted Mansion today, I saw Ezra pull my head off my shoulders and replace it with his own, Gus take his beard off of his face and put it on mine, and Phineas blow my head up in a Disney-style balloon, only to let it deflate in the air, landing back on my neck. 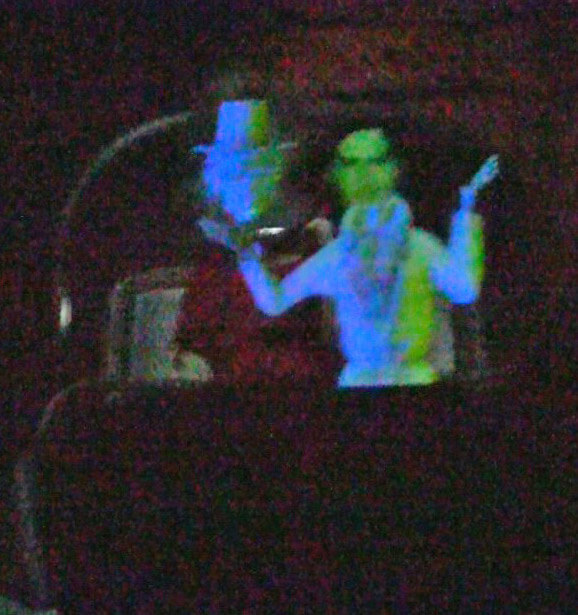 Nearby, guests riding with two people in a Doom Buggy had their heads swapped or found any of these Hitchhiking Ghosts sitting on top of their carriages, sometimes shining a lantern on them. While a bit grainy in the video above, the effect in real life is flawless. The mirrors are as clear as ever, with the ghosts looking just as good. The effect is convincing, as if the ghosts are truly sitting in and around the Doom Buggies, with great depth given to the ghosts. 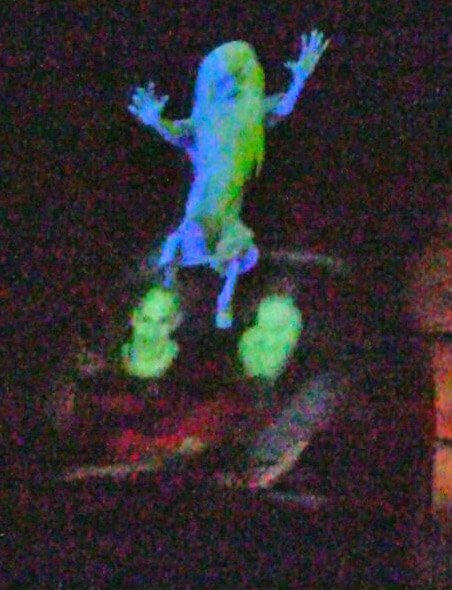 The animation is smooth and guests around me seemed to love the latest bit of “plussing” added to The Haunted Mansion. The technology used to track guests’ movements, enabling ghosts to interact, is completely hidden, leaving nothing but pure Disney magic. This latest round of new effects in The Haunted Mansion continues and ongoing effort to enhance the attraction that included new scenes being added four years ago. But it seems, for now, the dark ride’s additions are complete, with the new interactive queue open and inside effects and animatronics all in place. After a anticipation-filled few weeks of the Hitchhiking Ghosts being temporarily covered by flat projections, Imagineers have now shown off what they’re capable of creating with the stunning new fun that ends a ride through The Haunted Mansion. All Haunted Mansion fans should immediately find their way to the Magic Kingdom to witness these new effects for themselves, as they are truly incredible to see in person. Watch the Green Lantern footage that tore the roof off Wondercon! Charlie Jane Anders — Green Lantern won over a skeptical crowd with hot new footage of superhero space opera action last night. And now you can see for yourself! Warner Bros. uploaded four minutes of new scenes, a condensed and edited version of what we saw yesterday. Does it wow you as much as it did the crowds at the Moscone Center? Also, we've got some screencaps below. Hal Jordan surrounded by alien Green Lanterns. To his right is Tomar-Re, to his left is M'Dahna, plus one other alien GL that I don't recognize off the top of my head. More alien Green Lanterns. I see Isamot Kol and what looks like Salakk. Morro, Kilowog, Boodikka and maybe Bzzd? The rocky fellow is Hannu, and I'm blanking out on who the other folks are right now. Suggestions? They all turn and look at us, giving us a better view. Everybody shoots his/her/its power ring skywards. A nice aerial view of some of those alien lanterns. A pretty good look at Parallax in action. One last look at all those alien Lanterns.One last look at all those alien Lanterns. Charlie Jane Anders — Warner Bros.' Green Lantern had a lot to prove going into Wondercon, after a bit of a fan backlash against the movie's first trailer and some lackluster promo images. So did the emerald champion win some cred tonight? Judging from the reaction of the capacity crowd in the Moscone Center's ballroom, it seemed like the answer was yes. We saw some footage, we got to talk to stars Ryan Reynolds and Blake Lively, and we discovered that Green Lantern may not be as much of a zany comedy as the first trailer made it appear. First, the footage: It was the same stuff shown at Cinemacon the other day in Las Vegas. It starts with the caption "Sector 2814." And we see the Green Lantern warrior Abin Sur in his spaceship, controlling a GUI the same as Microsoft's Zune. And Abin Sur talks to Sinestro about his mission to the planet Ventara – but Sinestro tells him the mission is cancelled, because Ventara has been destroyed. Abin Sur is shocked: "Ventara's dead? The planet's inhabitants?" It's just like that other planet, Sinestro says. Sinestro has demanded an audience with the Guardians, the Lanterns' alien masters. A second later, the conference is interrupted – there's an alarm and the wall of Abin Sur's spaceship blows up. He's being attacked by a scowling yellow mouth. Abin Sur shoots energy from his ring, in a sort of pew-pew-pew fashion, but he's forced to beat a retreat and get into an escape pod. He's mortally injured, and he sends a last message saying he's heading for the nearest planet and launching the selection process for his replacement. Then we see Hal Jordan (Ryan Reynolds) being swept in a green energy bubble over to where Abin Sur's spaceship is crashed at the water's edge. Hal is freaked out to find a pink alien in a see-through spaceship, especially when he finds out that the alien is dying. He wants to get the alien to a hospital where they can give him a transfusion of "purple blood." Abin Sur asks Hal his name and says the lantern has chosen him. Abin tells Hal to take his ring and the lantern in his ship, and say the oath and touch the ring to the lantern. Hal keeps begging Abin Sur to breathe, but Abin Sur dies and his chest light goes out. "Aw, come on," Hal says. Then we see Hal in his apartment, looking at the lantern and trying to figure out the mysterious oath he's supposed to say. "Because everybody knows the oath, we used to sing it in camp," he quips. He tries: "I, Hal Jordan, do solemnly swear to pledge allegiance to a lantern, from a dying purple alien in a swamp." The lantern zaps him with a green energy beam and he's thrown backwards. Then suddenly he knows the oath – looking into the green light, he says the oath super intensely. Then Hal is flying through space in a ball of green energy, past the International Space Station and two astonished astronauts. He goes through a wormhole and then he's approaching the planet Oa, where green energy beams are zapping out into space. Now he has the uniform and the mask on, and he starts posing and preening, until the fish-headed alien Tomar-Re asks him if he's done showing off. The mask disappears, because Hal doesn't need to protect his identity here. Hal is astonished that he can understand alien languages, and he also knows all about Tomar-Re's race, because the ring gives him a working knowledge base. "In truth, we were curious. The process has never been attempted on a species as young as humans before," says Tomar-Re. "You are the first to be chosen. I've been sent to welcome you here." Lanterns, I've called you here to this unprecedented gathering, because we face an unprecedented danger. An enemy called Parallax that we don't fully understand. We do know it's powerful enough to destroy entire civilizations. Powerful enough to defeat even Abin Sur, our finest warrior. Alone, we are vulnerable. United, we are still invincible. We have never been been defeated. Will we be defeated now? It was for this moment that we were created. I don't need to tell you your duty. I don't need to tell you who we are. And everybody chants: "We are the Corps! We are the Corps! We are the Corps!" And they all shoot their green energy beams up into space as one. Then we saw a few snippets of the new trailer, including a few scenes that weren't in the earlier trailer – like Hal Jordan being zapped by yellow energy, to the point where he's almost crucified. And supervillain Hector Hammond, with his grossly swollen head, puts on Hal Jordan's ring! And we see Hal Jordan shooting a machine gun made by his ring. During the question-and-answer session after the footage, Blake Lively (Carol Ferris) talked a bit about whether she'll get to play the villain Star Sapphire in a sequel. "The only thing that's a little more daunting is the outfit," said Lively. "Maybe they could put a little more material on, it's pretty daunting." Hal and Carol are rivals, they're both fighter pilots. In the air, they go neck and neck. He works for her in this aviation company and he's completely irresponsible, he crashes millions of dollars of hardware. Also in the Q&A during the panel, someone asked whether the villain Atrocitus might show up in this movie, and producer Geoff Johns, who's written a lot of the comics. Johns said Atrocitus is "not in this one," putting a lot of emphasis on the words "this one," and adding that that might be construed as a hint. Ryan Reynolds joked that to prepare to look good in this film, he ate a diet of nothing but orphans and bench-pressed live pandas. During the roundtable interviews after the panel, Reynolds said that he has some ring constructs that are his favorites in the film, but the machine-gun construct wasn't necessarily one of them. The coolest ring constructs, Reynolds hinted, are ones we haven't seen yet. And Reynolds told reporters in the roundtable that if they are lucky enough to make another Green Lantern film, they'll have a huge advantage. They won't need to introduce Green Lantern from scratch and explain all about the ring and the Corps. And they won't need to do as much pre-production and spending as much time trying to figure out how to make these things look cool. And if they do make a sequel, Reynolds says he already knows where the story will go. It's set in stone already. And once you've seen the end of this movie, you'll know where the story is going too. The technology to do Green Lantern right only recently existed, but Reynolds felt really confident that Warner Bros. would do this right, on the strength of Harry Potter and other films. A lot of the Lord of the Rings crew worked on the Lantern effects. The big advantage of Green Lantern over other superhero origin stories is that the the story doesn't start in the third act, like the other films. Reynolds spent a lot of time at an Air Force base in Louisiana, where they were filming the movie, and seeing what the culture of fighter pilots is like. "I come from a family of cops, there's an unspoken code there that's going on and these guys have it," says Reynolds. The humor in the film comes out of the situation and isn't overwhelming – Reynolds said that you need a bit of levity here and there so that mainstream audiences can deal with the idea of a regular guy being zapped into another galaxy to an alien planet full of weird creatures. But most of the heavy comedy in the film is stuff we've already seen in the first trailer, because those were the Earthbound scenes that were done in time for that trailer. Once Hal is "humbled by the gift" of the power ring, he stops being so "arrogant and cocky," Reynolds told reporters, and that means less jokiness. Also, Blake Lively told reporters that director Martin Campbell really took the responsibility of bringing this story to life seriously, without looking too goofy. "He's a guy with a magic ring and a magic lamp," she said. "You have to tell this story well." James Cameron’s recent trip to Brazil wasn’t just about attending sustainability forums with Bill Clinton and posing for tribal photos with Arnold Schwarzenegger — it was about getting in the mindset for the Avatar sequel. For Cameron, this meant enjoying a restaurant dinner with the Caipo tribe, vowing to name a character in Avatar 2 after himself, and threatening to submerge the cast of his sequel into the indigenous lifestyle. After dining with five members of the Caiapo tribe during his South American adventure, the Avatar director told reporters that the chief had baptized him “Krapremp-ti,” which translates to “man who is a friend of the jungle.” Cameron then vowed to not only name a character in his sequel “Krapremp-ti,” but to pack up his cast and take them to the far reaches of the Brazilian rain forest so that they could be inspired themselves. Additionally, Cameron was so impressed by the tribe that he admitted Avatar would have been even better had he visited the Caiapo beforehand.